The $10.5 million scheme is part of Parks Without Borders, the Parks Department’s initiative to make green spaces more welcoming by removing physical barriers between parks and streets, among other design interventions. In service of this goal, the LPC-approved design completely removes three low-rise, cobblestone-edged landforms, Bye’s work from the 1970s. Paul Kidonakis, a landscape architect with the department, explained that, in the new plan, the agency had increased the planted area by 17 percent, with most of that greenery arranged along the contested allée. 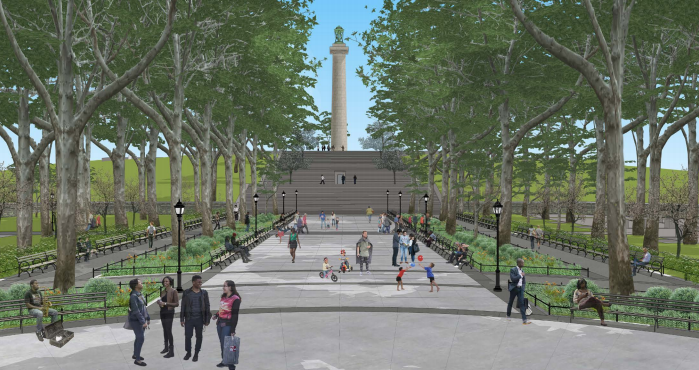 That thoroughfare will be widened into a grand promenade, leading strollers from a new low stone stair at the northwest entrance toward’s the park’s monumental stone steps. At 43 feet wide, the path will be a foot wider than the Central Park mall; there would be more paving—and more planting—overall, Kidonakis said. The view-impeding Honey Locust copse at the corner will be replaced by new trees as well. In light of September’s divisive testimony, Chair Meenakshi Srinivasan and Commissioner Frederick Bland said they visited the park between the two hearings to get a better sense of the place and Parks’ proposed modifications. “The axial arrangement, the opening up of the park—not just metaphorically, but physically—to the disabled and to people pushing baby carriages [creates] a sense of place at the corner that is consistent with this park. The memorial at the top of the hill cannot be denied, and a more formal relationship to that hilltop seems to be important to have,” Bland said. The paved plaza, he added, would open up the space to a greater variety of public gatherings. “This is a park that’s really evolved and changed. Some respect the earlier designs, some are adding something new. To me, it was helpful to understand that evolution,” said LPC Chair Meenakshi Srinivasan. 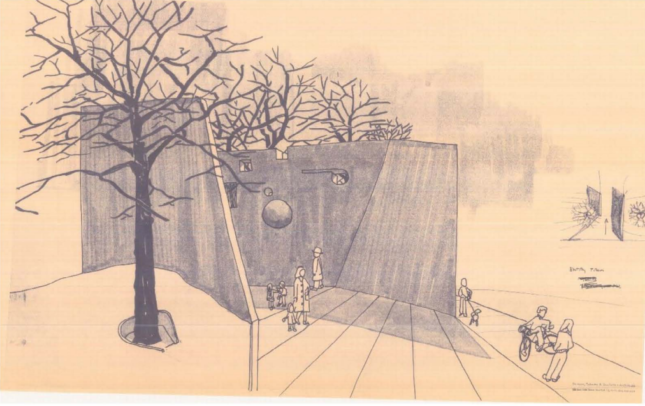 According to landscape preservation consultant Michael Gotkin, all the designers responded to Olmsted and Vaux’s design intent, though it would be a grave mistake to assume the richly layered park could be returned to a pure or original form. Before this hearing, concerned neighbors formed a group, Friends of Fort Greene Park, to advocate against the Parks Department’s proposed changes to the northwest entrance. (The group is separate from the Fort Greene Park Conservancy, the group that stewards the park.). To the Friends group, issues with the design extend beyond preserving Bye’s mounds and up to the trees. The Friends group has retained attorney Michael Gruen to explore options for opposing the plan. Gruen is also the president of the City Club of New York, a civic advocacy group that was one of Pier 55’s main opponents. As far as legal options go, “we are aware of possible approaches, and we’re now going to consider what to do,” Gruen said.